The Texas Catholic Conference of Bishops opposes compelling local and state agencies to enforce federal immigration laws and supports targeted, proportional, and humane enforcement. The Catholic Church accepts the legitimate role of the U.S. government in intercepting unauthorized migrants who attempt to travel to the United States. Expanding lawful means for migrants to live and work in the United States enables law enforcement to focus upon those who truly threaten public safety: drug cartel members, human traffickers, smugglers, and terrorists. Enforcement measures must be targeted, proportional, and humane. Unfortunately, some policies and tactics in effect or proposed at both the federal and state level do not meet that standard. Rather, they undermine the human dignity of migrants and create a confrontational and often violent relationship between enforcement officers and migrants. This results in negative impacts on the rule of law and the maintenance of public order. We believe enforcement should be the responsibility of federal authorities. We urge them to develop training curricula to instruct agents in appropriate tactics. The curricula should include human rights so that agents are more sensitive to the handling of undocumented migrants. Community organizations, including dioceses and parishes, can assist in this effort. State and local law enforcement agencies can and should cooperate with federal authorities wherever it is feasible and consistent with their primary responsibilities: the maintenance of public order and protection of their communities. They should not be compelled to determine the legal status of persons who merely look like they may be illegal immigrants. No community is well-served if some of its members are afraid to speak to the police or to report crimes. Targeted. U.S. enforcement resources should be focused so those who are dangerous are more easily identified and apprehended. Enforcement policies should be tailored and not overly broad so the basic rights of all immigrants are not abridged. Ethnic or racial profiling should be avoided. Improvements in intelligence and information sharing, and technological improvements in border security would help ensure those who are most dangerous are intercepted. Proportional. Enforcement of immigration laws should not feature unnecessary penalties or force. Immigration control officers and border control agents should receive intensive training on appropriate enforcement tactics and use of force. Border enforcement policies should not force migrants into more remote regions of the desert, risking their lives. Humane. In any enforcement action, the human rights and dignity of the person should be preserved and respected to the greatest extent possible. Families should not be divided and should receive special consideration. Undocumented immigrants should not be detained for lengthy periods or intermingled with violent offenders. Asylum seekers should receive appropriate screening by a qualified adjudicator. Children should be accommodated within a child welfare context. 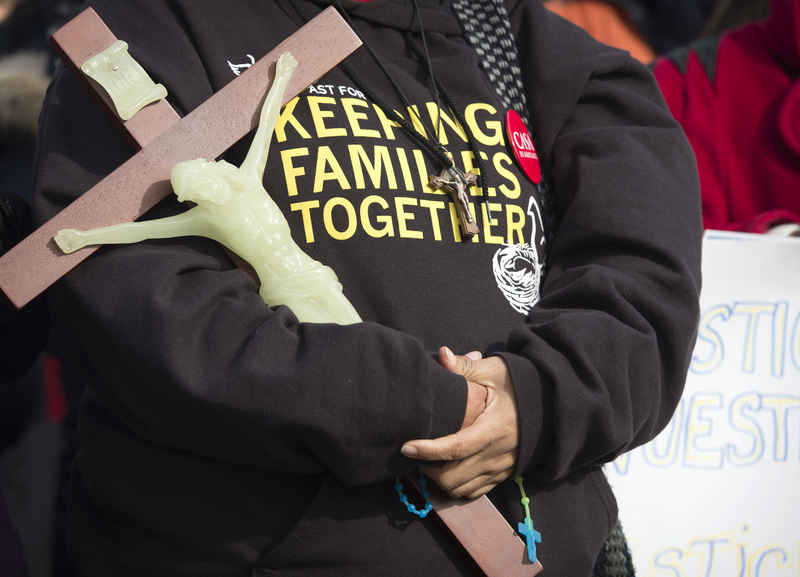 A woman holds a crucifix during a rally sponsored by immigration advocates Jan. 15 outside the Supreme Court in Washington. (CNS photo/Michael Reynolds, EPA) See GSR-SISTERS-IMMIGRATION March 17, 2016.